When I first heard that oxblood was the new thing, I thought “ugh, that sounds like the most un-appealing color ever. Like poop brown.” Apparently, it is just another name for maroon. Maybe just a shade or two lighter. Even though it is my school color (and indeed mascot, if a color can be a mascot), I’ve never liked maroon much. It just felt old. But since then, I’ve clearly been brainwashed by the recent onset of oxblood goods. On second thought, it may be just the right shade to go with all the blacks/grays of the season! So I headed to Aqua from Bloomingdales to check out what they have on offer. It’s one of my favourite brands to go to off-sale season, as they’re always on trend and relatively affordable. In combination with well timed friends and family discount, the value is unbeatable! When I saw the strapless red/silver dress, I knew I had to have it. It is just so pretttty and perfect for my upcoming birthday! It totally says birthday dress all over it. Plus, on non-birthday days, I can throw a leather jacket over it and get a rocker chic look (as the model does in their look book!). Alas, it was too warm on my birthday to wear a leather jacket. But it looked fabulous anyway! The material was a little flimsier than I expected from the pictures, but it worked out well as that (and the somewhat dizzying print) made it easier to DIY alter without anyone noticing. As I was browsing, I also came across the red v necked dress, which I thought was the perfect addition to my winter wardrobe. Just to spice it up a bit. Imagine the red peeking out from underneath my black winter trench. Very Kate Middleton! I had concerns about the elastic waist looking cheap, but it is not anything a nice wide belt won’t fix. But alas, I was still disappointed with the actual dress when I got it. It was WAY flimsier than I expected. A winter colored summer dress. Maybe I should’ve read the fine print more carefully. Now I’m just trying to wear it as much as possible before it gets too told. It works well with a belt and black blazer. Other items that caught my eye include the red leather dress and the red skinny jeans. I’m just not sure how comfortable a leather dress would be (how do people even wear leather skinnys???). 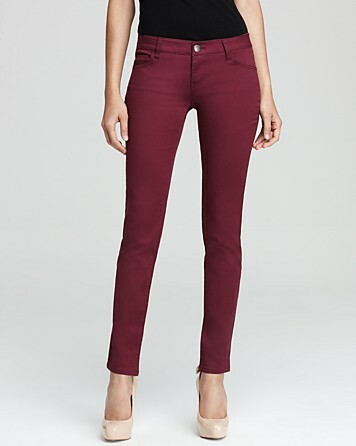 As for the red skinny jeans, it is love. But I don’t buy denim online without trying them on, unless they are J Brand.